I am so so stoked to introduce to you my ultimate dream bag - the Hermes Kelly 32cm with palladium hardware (preowned option here and here). The color I chose might come as a surprise to some of you. I always stick with classic colors or neutrals when it comes to handbags. However, when I came across this orange Kelly, it took my breath away. No one does color quite like Hermes. 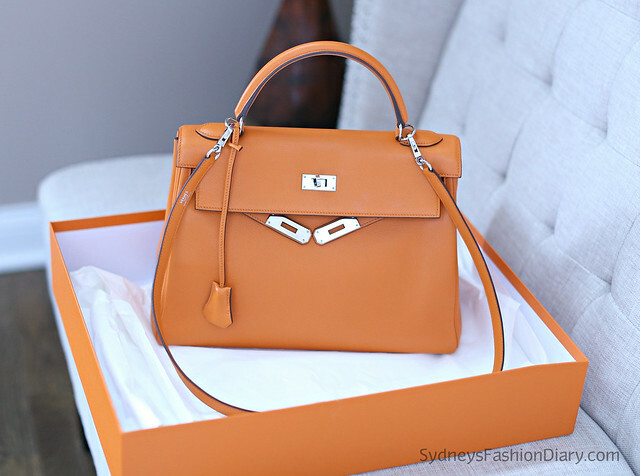 You can get basically any color you want from any brands but there is no other iconic orange like a Hermes Orange. Since I wear mostly neutrals, this beauty will add a punch of color to any of my outfits. Have a wonderful weekend, everyone! Wowweee count me in as in love too! Come check out how I styled my fave Joe's Jeans shorts at the blog! Great addition to your beautiful collection. Excited to see this in your look book! Have a great weekend!